Can Pixel Really Help Boost Alphabet Shares to $950? 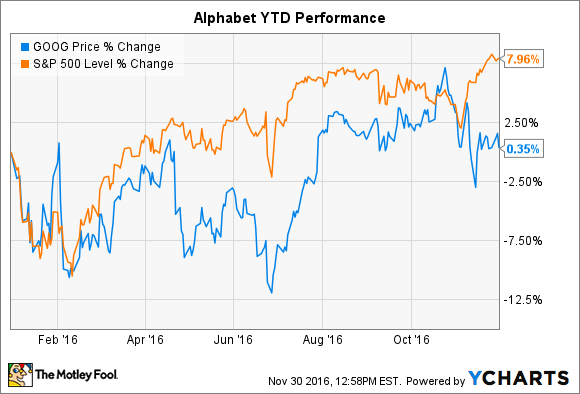 It's been a fairly uneventful year for Alphabet (NASDAQ:GOOG) (NASDAQ:GOOGL), at least as an investment. While the search giant has introduced some exciting new products this year, perhaps most notably its new Pixel smartphone, shares are flat -- and lagging the S&P 500. Yet, for the first three quarters of the year, revenue is up 20% to $64.2 billion while net income has gained 30% to $14.1 billion. A flat stock price combined with a growing bottom line is exactly the recipe for multiple compression, as investors have less confidence in the company's ability to grow going forward. 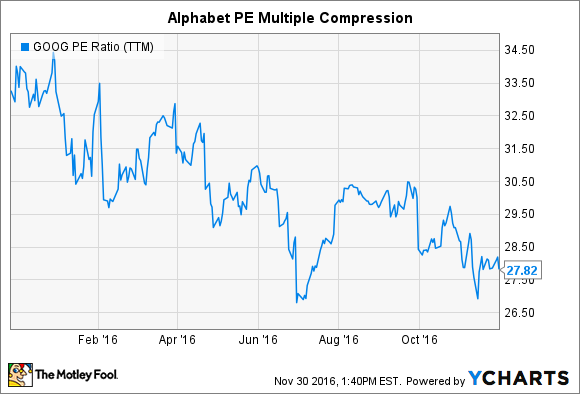 GOOG PE Ratio (TTM) data by YCharts. Morgan Stanley thinks that Alphabet can regain investor confidence, though, which would lead to multiple expansion, thanks in part to Pixel. In a recent research note (via Tech Trader Daily), analyst Brian Nowak lays out a four-part path to multiple expansion. Nowak currently has an overweight rating alongside a hefty $950 price target, implying 25% potential upside from current levels. The analyst thinks that improved monetization of maps, expanded text-based ads, the "4th mobile link," and Pixel will be the key drivers here. Combined, these four areas could generate an incremental $6.5 billion in sales next year, and that accelerated growth could be just what investors are asking for to start pricing in higher multiples. It's worth noting that Morgan Stanley expects Pixel to comprise roughly $3.8 billion of that total, or over half of the estimated gain from those four initiatives. But there's another irony here: It's almost unheard of for a software and services company to see multiple expansion from moving into hardware, which inevitably entails lower margins. For instance, the Pixel's gross margin is estimated to be in the ballpark of 25% -- quite a bit lower than Alphabet's trailing-12-month gross margin of 62%. While $3.8 billion in Pixel sales would still be a modest portion of the $106.6 billion in sales that Nowak expects Alphabet to generate next year, thereby mitigating the dilutive effects on profitability, Pixel will undoubtedly exert downward pressure on margins to some extent. As a new product, it's also entirely possible -- nay, likely -- that Pixel will operate at a loss initially as Google tries to ramp up distribution and continues investing in development. So Pixel could be even more dilutive when it comes to operating margins. Pixel will have a high bar to prove itself, but Nowak sees Pixel's value as strategic in nature. It appears that Google is trying to provide a "more integrated and consistent Android experience," according to the analyst. Pixel includes a lot of capabilities and features that could translate into higher Android user monetization levels, which Nowak believes will bolster the Android ecosystem. However, it's not clear how improved monetization of Pixel users would translate to the global installed base, particularly since third-party Android manufacturers don't always follow Google's example, as we saw with the Nexus program. Google's new flagship phone is an important move from a strategic perspective, but it's hard to see it contributing meaningfully from a financial perspective -- just like Nexus.